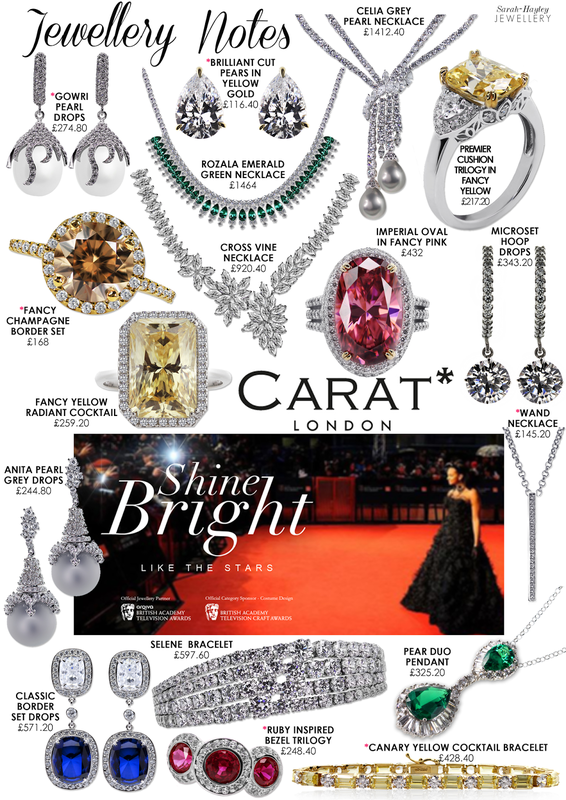 May Jewellery Notes: Introducing #CARATLondon - The Official Jewellery Partner of the BAFTA TV Awards. This month's Jewellery Notes start the first of four posts dedicated to the fantastical jewellery by CARAT* London. Over the weekend I will be bringing you lots of exciting news, including an interview with CARAT* CEO Scott Thompson, photos from my trip to the CARAT* flagship store in Covent Garden and concluding with live reporting from the CARAT* BAFTA TV styling suite and the BAFTA Red Carpet on Sunday. If you haven't already heard about CARAT* London, allow me to enlighten you. CARAT* formed in 2003 by Scott Thompson and has established itself as one of the world’s leading luxury fashion jewellers. The collection features timeless pieces with a modern edge, allowing you to fulfil your dreams wearing exceptionally crafted jewellery, with precision detailing, at an affordable price. CARAT* design and make all of their collections using their own uniquely created gemstones. Each stage of preparation is done by hand. While the gemstones are not natural you will not find a better alternative than CARAT*. Many jewellers including the fashion press have admitted that telling CARAT* gems apart from natural stones is difficult due to their very similar optical characteristics. This year will mark CARAT* 4th year as The Official Jewellery Partner to The BAFTA TV awards. A few weeks ago I attended a Red Carpet Masterclass with BAFTA TV at the beautiful Corinthia Hotel and had the opportunity to try on the pieces. In my opinion if you love jewellery, you cannot help but adore everything. I am used to working with fine jewellery - especially when I am styling and I can recognise a quality piece when I see it. With CARAT* you have this intense radiance from the stone coupled with meticulous attention to the precious metal. Quality is what makes CARAT* stand out from other fashion jewellers, it's faultless. The collection above features my favourite pieces from the BAFTA 2014 collection. I have also included my other favourites from other collections. These are identified by an asterisk*.